Welcome to Armonia SPA! Here you will find the answers to all your questions. How can I enter into wellness area? it’s obligatory to use bathing costume. Before enter into Spa, you will receive a Spa Kit, including towels and flip flop. How does the wellness path work? 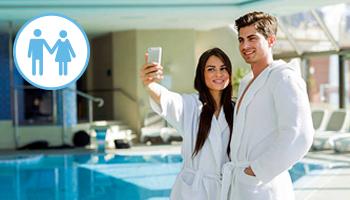 The path lasts two hours and, during this time, guests are free to use the Spa in total autonomy; however it is advisable to follow the indications of the staff about the duration of the individual elements of the route (swimming pool, sauna, Turkish bath, whirlpools, relax area). Reservation for the Spa, as well as massages and treatments, is mandatory. It is advisable to book in advance so you can choose the day and time better for you. We recommend to arrive at least 10 minutes in advance of the reservation. If you can not arrive on time, the treatment will end anyway at the agreed time, so we will avoid further delays. Based on the availability, you can ask to our staff for a time extension and the eventually price. Is it possible to cancel and/or modify a reservation? If you need to cancel or move the treatment appointment, it’s necessary to notify us 3 hours in advance, in order to reorganize our calendar and to avoid the charge of reserved treatment. Is it possible to bring food and drink inside the SPA? It is not possible to introduce and consume food or drinks inside the wellness center; only drinks and food provided by our staff are allowed. Are there any lockers in the locker rooms? Yes, you will receive the key for the locker at your arrival. Does the Spa have a bar/restaurant? Inside the hotel, that hosts the SPA, there is a bar for light lunch (toast, sandwiches, salads) or for aperitifs and you find even the restaurant Mama’s Kitchen. For information about restaurant and to make a reservation, please call 02959496. Is there a parking in the area? There is an ample free parking available to all the guests of Spa. Are there any hotels near the Spa? 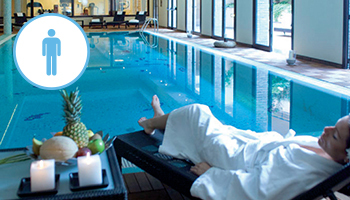 The SPA is located within AS Hotel Cambiago, an elegant 4 Star hotel. For this reason we offer HOTEL + WELLNESS PACKAGES that combine the Spa path and treatments with a comfortable overnight stay at the hotel. Can I give the access at wellness center to someone? Our “Gift Voucher” is a special thought to present for any kind of occasion. Our offers and services can be bought as a gift voucher. To give a personalized gift voucher contact us at 02.95.94.96 – int. 3, or by e-mail to spacambiago@ashotels.it.